Kampala 25 February 2019. The Regional Universities Forum for Capacity Building in Agriculture (RUFORUM) a consortium of 105 Universities in 37 Countries in Africa under its Vision 2030 is implementing the TAGDev (http://www.ruforum.org/MCF/), one of the four flagships, that aim at transforming African Agricultural Universities and their graduates to meaningfully contribute to Africa’s growth and development. Through this Flagship, Community Action Research Programmes Plus (CARP+) projects are implemented. In October, 2018, RUFORUM advertised a call for proposals (CARP+ Call 2018) targeting RUFORUM member universities in Angola, Namibia, South Africa, Eswatini, Lesotho, Botswana and Zambia. South Africa Building Competitiveness for communal farmers through developing the wool value chain in the Free State Province of South Africa. Project 1: Building Competitiveness for communal farmers through developing the wool value chain in the Free State Province of South Africa. The South African wool industry is in a privileged position and has ample opportunity for growth. Wool prices are doing remarkably well, and economists and wool buyers believe this trend will continue due to international market demand exceeding the supply. The creation of niche products from wool will add to the existing value chain, creating more jobs and an opportunity for enlarging the export market. This project seeks to transform communal wool growers’ production from an underachieving enterprise to a profitable, sustainable, and renewable venture to enhance the livelihoods of communal wool producers. This will be achieved by: (1) assisting in establishing a centralised infrastructure hub, to support wool production and processing – the University of the Free State’s experimental farm will be utilised for this purpose; (2) building wool growers’, sheep shearers’ and women from the community’s capacity by knowledge and skills training; (3) introducing formal structures to organise wool growers and link them to markets and as a result give them collaborative advantage; and (4) assisting the beneficiaries to develop commercial market engagements for wool and wool products produced by the communal farmers and community women. This project is designed to incorporate research and dissemination components. The research component will include the evaluation, testing and further development of certain technologies and social and economic situations. The academic staff, students from the University of the Free State and the interns from the TVET will be working closely with communal wool growers, commercial farmers and private-sector industry players. Safflower is a drought, heat, cold and saline tolerant crop. In the arid and semi-arid regions loss of yield is the main concern for arable farmers. Growing a multipurpose, drought, saline and temperature tolerant crops such as safflower enhances the farmers’ adaptive capacity to mitigate the effects of climate variability and change; improve food security and reduce reliance on food imports and improve the livestock sub-sector through the availability of feed among other benefits. The overall objective of this project is to enhance safflower production and product development among safflower farmers in Botswana. The project will specifically: 1) evaluate safflower genotypes performance for morphological characteristics, seed yield and yield components, oil yield, and composition grown on-farm in four growing sites; 2) evaluate safflower nitrogen and phosphorus requirements in different soils under on-farm trials in three growing sites; 3) determine safflower genotypes suitable for petal production and time of harvesting on petal and seed yield, carthamin and carthamidin content in three growing sites; 4) determine insect pest status, diversity, population dynamics and their natural enemies plus beneficial insects on five safflower genotypes in three growing sites both in winter and summer; 5) evaluate effects of nitrogen fertilizer application on safflower insect pest population dynamics, their natural enemies and beneficial insect; 6) support development of curriculum in two Technical and vocational education and training (TVET) institutions (offering certificate in agriculture) in line with the National Credit and Qualifications Framework (NCQF) as required by the Botswana Qualifications Authority (BQA; 7) enhance TVET students and staff capacities in research and; 8) enhance farmers’ capacities in safflower growing, processing, product development and marketing. Namibia is home to the driest climate in sub-Saharan Africa characterised by recurrent droughts with detrimental effects on local farmers. The country is predominated by extensive farming with livestock mainly depending on rangelands for feed resources. It has been estimated that about 45 million hectares of land in Namibia has undergone bush encroachment leading to reduction in the availability of desirable and palatable grasses and browse, loss of biodiversity as well as loss of ecosystem functions and benefits. This project seeks to sustainably utilise and add value to encroacher bushes through selective thinning as a mechanism to rangeland restoration, creation of economic opportunities and increasing food security as well as enhancing drought resilience. Specifically, the project will: 1) determine the nutritional and anti-nutritional content of selected encroacher bush species at different phenological stages of growth; 2) determine the charcoal and biochar yield potential of different encroacher bush species; 3) evaluate the effect of treatment with wood ash, biochar and PEG on the nutritive value of bush feed with special focus on tannin contents, feed intake and digestibility; 4) evaluate the effectiveness of biochar on preventing plant poisoning to ruminants; 5) determine the ensilability of bush feed using different silage enhancers (lactic acid bacteria (LAB) inoculants, molasses, grain malt; and analyse the effects of three different preservation methods (pelletizing, drying and ensiling) on the nutritive value of bush feed; 6) evaluate the effect of feeding encroacher bush silage on milk yield, milk composition and milk products quality in dairy goats; and further evaluate its effects on growth performance, blood metabolites, and carcass characteristics of Kalahari Red kids; 7) support the production of oyster mushroom, and mushroom value addition. The project will utilise a holistic value chain approach taking advantage of the opportunities that the different parts of the bush confers. PhD in Agricultural Sciences, Economics or related disciplines. Postgraduate training/experience in Program/ Project Management. At least eight years’ experience in a reputable public/private organization managing agricultural and STI programmes. Ability to understand group dynamics and to solicit varying points of view, ideas and opinions from members of teams to form specific decisions. Ability to understand broader operational context and opportunities that provide high impact or cross functional solutions for RUFORUM. Demonstrated ability to design and manage projects, raise funding and to work in multi-stakeholder platforms. Ability to consider long-term business implications or devise appropriate solutions for the implementation of the RUFORUM Vision 2030 program/ project initiatives. This is a regionally recruited position which offers attractive remuneration package. The position is open only to Nationals of Member States where RUFORUM operates. The initial contract period will be for 3 years renewable, subject to probationary period of six months. Dr Nakayiwa joins RUFORUM from Makerere University where she has been the Director of the Planning and Development Department. She has over twenty years’ experience in the higher education sector in Africa. She brings vast experience in institutional development in higher education, policy engagement, development partners’ collaboration and partnership development and networking to the RUFORUM Secretariat and its wider network at large. She has previously overseen and provided leadership to the strategic planning processes at Makerere University and various institutions to which she has served in the different capacity as a Board member. She has been the Programme Coordinator of several Development Partner Programmes at Makerere University. These include, among others, the MasterCard Foundation Scholars Programme at Makerere University and the African Development Bank- Higher Education Science and Technology Programme. 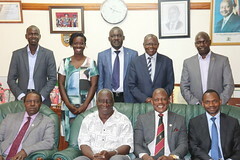 She has been a Board member of the African Higher Education Advancement – AHEAD Initiative, also a board Member to the Youth After School Initiative and a Board Member of the Makerere University Walter Reed Programme. Dr Nakayiwa is a DAAD Fellow: University Leadership Programme that targeted Project Management, Financial Management and Human Resource Management in Higher Education at the University of Oldenburg- Germany. She is a fellow to the International Visitors Leadership Program, A Voluntary Visitors Program on Higher Education Financing and Administration; and an Associate Fellow of the Centre for Higher Education Trust based in South Africa. Dr Florence Nakayiwa has a Doctor of Business Administration in Higher Education Management from the University of Bath, United Kingdom and a Masters’ Degree in Economic Policy Management from Makerere University. Ms. Adidja joins RUFORUM from Universite Catholique de Bukavu (UCB) in Democratic Republic of Congo (DRC). She has served in higher education as a fellow at the university at the Institut Superieur de Development Rural (ISDR/Bukavu), Universite Libre des Grand Lacs ( ULGL/Bukavu) and Universite Evangelique en Afrique (UEA) for five years and brings this experience into the RUFORUM Secretariat. Her experience in regional African mobility both as a lived experience through her education and practice in the DR Congo is vital in supporting the coordinating function for the mobility arrangements at the RUFORUM Secretariat. Over the years of service, she has demonstrated the power of mobility education by increasing the participation of disadvantaged fellows from DR. Congo to access education outside DR. Congo, a conflict and post-conflict environment. Ms. Adidja holds Masters in Integrated Watershed Management of Makerere University. RUFORUM is currently comprised of staff from Ghana, Sudan, Zimbabwe, Benin, Uganda, Democratic Republic of Congo, Kenya and Malawi.